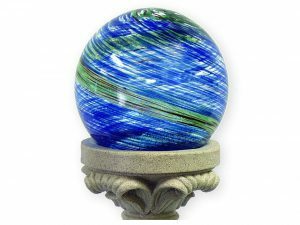 - Decorative gazing globe with interior dark-blue swirl finish with streak of light blue and green. - Luminescent crystals within globe absorb solar energy during the day and emit a soothing light green glow. - Note: For best results place globe in a location where it will receive no competing light source at night. Glow will only occur within the green swirl portion of the globe and is comparable to the glow seen on a watch face piece. Glow will gradually fade over time. - Fits most standard globe stands, columns & pedestals (search "Echo Valley Globe Stand"). - Refer to the PDF attached below in Technical Specification for Application Guide.